The Visualizing Sustainable Transportation project utilized new and innovative tools to improve the public outreach and engagement process. Phase 1 utilized augmented reality technology to demonstrate potential future sustainable transportation and land use options at two locations: Soquel Drive at Chanticleer Avenue and Natural Bridges Drive at the rail crossing. Physical installations, called OWL viewers were placed at the two sites. Looking into the OWL viewers participants saw how existing conditions could transform into multimodal transportation hubs with short and long term investments. For Phase 2 of the Visualizing Sustainable Transportation project the RTC partnered with the City of Watsonville on the Downtown Complete Streets Plan which includes transportation improvements that enable safe access for all users, including pedestrians, bicyclists, transit riders, and motorists of all ages and abilities. The RTC worked closely with the City to develop renderings of potential improvements in virtual reality (VR). By using VR to visualize potential improvements the RTC improved and expanded the public participation process to different demographics and audiences. The input received will help the City of Watsonville determine which transportation improvements to include in the Downtown Complete Streets Plan. The goal of this project is to enhance public engagement and dialogue of complex transportation and land use concepts. The results of this project to expand and enhance RTC’s outreach process are documented in the final report. 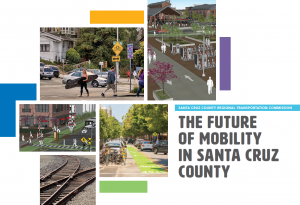 The RTC report was completed in advance of the Downtown Watsonville Complete Streets Plan. Please check the City of Watsonville website for information related to their plan.